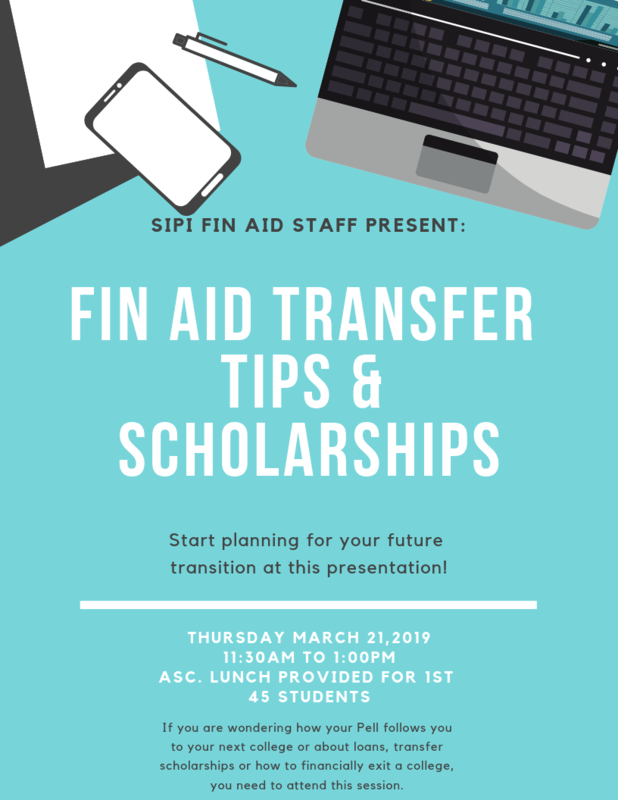 The Mission of SIPI Financial Aid Office is to administer funds in order to provide financial assistance to students who demonstrate financial need and to help support institutional enrollment and retention goals. This will accomplished by working together, as a team of financial aid professionals, to provide the highest quality of service to our students, co-workers, and the SIPI Community as a whole. Excellence is our common goal and professionalism our standard. Continue to strive to provide superior customer service, take advantage of emerging technologies and be a contributor to student success. The Office of Financial Aid is responsible for the administration of the student financial aid programs and financial counseling to students who apply for aid. Students applying for financial aid should complete a Free Application for Federal Student Aid (FAFSA). Students should apply over the Internet at http://www.fafsa.ed.gov, FAFSA applications are also available at the SIPI Financial Aid Office (FAO) located in the Occupational Technology Bldg., rooms 173 & 174. The office hours are M-F from 8:30 a.m. to 12:00 p.m., T & R 1:00 p.m. to 4:00 p.m.. Financial Aid personnel are available to assist students with completing the financial aid process. For help in filling out the FAFSA, students can go to the DOE "Applying for Financial Aid" web site at http://www.studentaid.ed.gov . Students are encouraged to apply as early as possible in order to meet financial aid deadlines and eliminate delays in obtaining financial aid. 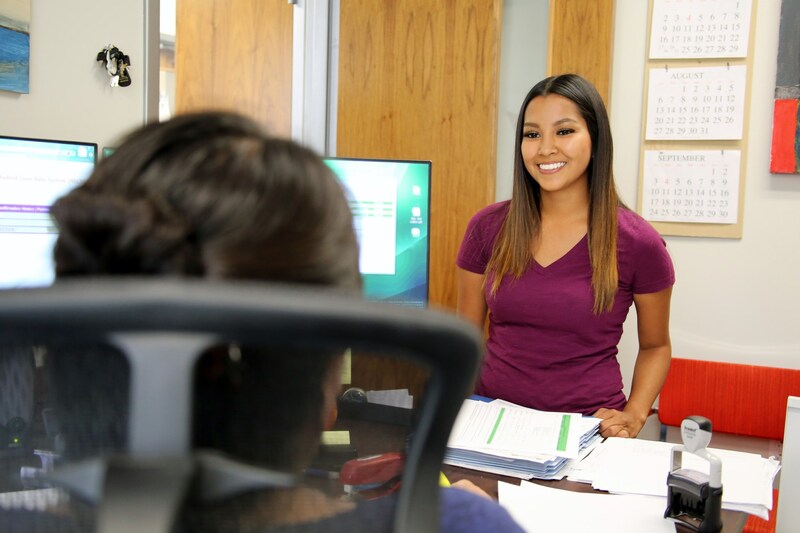 Information and assistance concerning the various financial aid programs can be obtained from various high school counselors, BIA and tribal education counselors. The Financial Aid Office posts all known scholarship/internship opportunities on a bulletin board located just outside the financial aid office. SIPI's Title IV school code is 011185. For additional school codes log on to http://www.fafsa.ed.gov. To receive financial aid, students must be enrolled as a regular student in an eligible program. To qualify for a full-time financial aid award, students are required to carry a minimum class load of twelve (12) credit hours and maintain satisfactory academic progress of 2.0 GPA minimum. Part-time students are also eligible for financial aid. Students may not owe an overpayment on a PELL grant and must not be in default on any Title IV loans at any school previously attended. Transfer students must provide an academic transcript from every post-secondary school they attended, even though they may not have received any financial aid. Effective July 1, 2000, schools are authorized to use data from the NSLDS to monitor the financial aid history of all applicants for Federal student aid. Academic transcripts will need to be reviewed to quantify academic progress. SIPI currently has a maximum time frame not to exceed 150% of the published length of the program for Federal financial aid eligibility. Students must have a high school diploma or passing scores from the HSET program (formerly the GED® Program). Students must answer questions about drug convictions. In some cases, students convicted of drug-related offenses may not be eligible to receive federal financial aid for a period of time. Note: SIPI does not participate in any educational student loan programs. The net price calculator is for prospective and current students. By answering a few simple questions, the calculator will present you with an estimate of your full-time 2013-2014 cost of attendance and financial aid at Southwestern Indian Polytechnic Institute. When you complete the calculator online form, you are not applying for aid. Please visit SIPI's Financial Aid Office to apply for financial aid. The Title IV Consolidation Appropriation Act of 2012 limits the amount of Federal Pell Grant eligibility to 12 full-time semesters for all recipients. The new law applies to all previous, current and future Federal Pell Grant disbursements. In order to make sure educational goals are achieved within the 12 full-time semesters time frame, recipients should follow a degree plan and periodically meet with an Academic Advisor or Counselor to discuss graduation or transfer plans. Once notified by the Department of Education and/or SIPI Financial Aid Office, recipients who exceed the 12 full-time semesters time frame cannot receive a Federal Pell Grant for any future coursework. This policy applies to students who withdraw (official, unofficially or fail to return from a Leave of Absence) or are dismissed from enrollment at the Southwestern Indian Polytechnic Institute, SIPI. The Return of Title IV Funds (R2T4) process is separate and distinct from the SIPI’s Refund Policy. The calculated amount of the "Return of Title IV Funds" that is required for students affected by this policy are determined according to the following definitions and procedures, as prescribed by regulation. Upon the student’s withdrawal, the amount of financial aid that has been “earned” by the student is based on the number of days of attendance. Students who withdraw unofficially will also be subject to the Federal Return of Title IV Funds Policy (R2T4). According to federal guidelines of R2T4, students who receive financial aid and then withdraw from all course work before 60% completion of the trimester may have to pay back a portion of the grants received. The amount is determined by using a federal formula. The R2T4 is completed within 45 days of notification. All funds will be returned in the order of PELL, TEACH and FSEOG. The student withdraw date is determined by the withdrawal process. Federal and State regulations require all schools participating in state and federal financial aid programs to have a Standard of Satisfactory Academic Progress (SAP). The standard will be applied to all applicants and recipients of financial aid as a determination of eligibility. These standards are applicable to all students whether they are eligible for the Title IV funding or not. SAP represents minimal standards of completion for financial aid eligibility, SIPI will review SAP at the end of each trimester. In order to receive financial aid, the student must be enrolled in an eligible program of study that leads to a Certificate or an Associate’s Degree. In addition students must adhere to two different standards; qualitative standard which is the maximum length of time for which they may receive financial aid, maintain the minimum grade point average (GPA); and quantitative standard which is to complete the number of credits required to meet the minimum pace of progression each trimester. Q. How will I be notified if I’ve exceeded the LEU (Lifetime Eligibility Used) timeframe? A. You will receive an e-mail from the Department of Education. Q. What if I attend another institution or change majors, will my LEU time frame be reset? A. No, the LEU time frame does not reset itself based on transferring to another institution or changing your major. Q. Is there any appeal or continuation process available if I’ve exceeded the LEU timeframe? A. No, There is not a process through the Department of Education or SIPI FAO to continue receiving Federal Pell Grant funds once the timeframe has been exceeded. Q. If I’ve exceeded the LEU time frame, can I still receive other types of aid? A. As long as you are meeting Satisfactory Academic Progress) and all other requirements, you may be eligible and can apply for other types of aid. Q. How can I check my LEU percentage to monitor the total amount of Federal Pell Grant I’ve currently used? This program is designed to provide financial assistance to students through part-time employment on campus. Work-study students are paid the minimum wage and payments are issued on a bi-weekly basis. Work schedules are determined by class schedules and job requirements. The Supplemental Educational Grant (SEOG) is available to exceptionally needy students who wish to attend SIPI, such as students with the greatest of need and who are PELL eligible. Must have graduated from a New Mexico high school or obtained a GED® from New Mexico. Must not be receiving any other type of aid. The NMSSIG is available for New Mexico residents who are full-time students, are PELL eligible and who are determined to have exceptional need. If funds are available, part-time students may be eligible. NOTE: SIPI does not participate in any loan programs. Will become available January 2019.